Melinda Uy is a half-Filipino, half-Chinese struggling mother to four children married to a full-Chinese blood man. Her family was believed to bring curse to Olive's family. Because of this, Melinda was not accepted by Uy's family as one of their members. Melinda's struggling as a mother beg and when she has nothing else to do but to strive and work more. Mano Po 6: A Mother's Love is the sixth installment in the Mano Po film franchise, following Mano Po 5: Gua Ai Di in 2006. 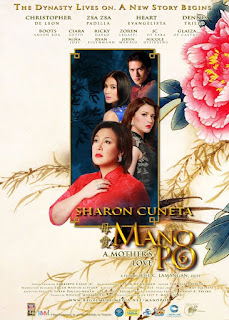 Produced by Regal Entertainment, Mano Po 6 marks the first appearance of the Sharon Cuneta in a Regal movie. Co-starring with Sharon are: Zsa Zsa Padilla (in her third Mano Po role), Christopher De Leon, Boots Anson-Roa (fourth appearance in the Mano Po series), Kris Aquino (in her third Mano Po role), Dennis Trillo (in another Mano Po appearance, last seen in Mano Po III: My Love), former ABS-CBN talent and GMA actress Heart Evangelista, and Ciara Sotto. Joel Lamangan, who had last worked with Sharon in Walang Kapalit, was at the helm, in his fifth Mano Po directorial job.